Blacktwins, also known as Blacktwins13 and abbreviated as BT, is a Cloud, Mario and Fox main from Canada. 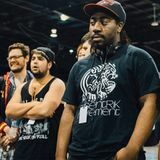 He was the director of Neo Canadia 5, and formerly ran one of two Smash 4 weekly series in Toronto, Codename: Salty Bets. Aside from his mains, he is capable of playing multiple characters in Smash 4, which gives him an edge in character knowledge over most players in his region. He is considered the second best Mario player in Canada (behind Ally), best Cloud and Fox co-main in Canada. He is also the best Lucario and Lucina player in Canada. He is currently ranked 1st and 4th on the Southern Ontario Power Rankings for Smash 4 and Brawl respectively, as well as 6th on the Canada Smash Ranking. He uses the Wii Remote and Nunchuk. This page was last edited on April 6, 2019, at 13:42.